It’s that time of year again – the Perseid Meteor Shower lottery is upon us! Will we see some meteors, or a LOT of meteors? Or will the curse strike us again? Everybody is talking about how great the meteor shower will be this year, but I’m very much in doubt that we will actually get to see them. The Perseids will peak on August 12 as usual, so the night from the 12th to the 13th will probably be the best chance to look for meteors, but generally the few days around the peak date are usually good too. Unfortunately this year it looks like we won’t be able to see any meteors due to the absolutely abysmal weather we are having here in Germany at the moment – it’s not only raining buckets, but also very cold, so I’m afraid I’ll have to give the Perseids a miss this year. 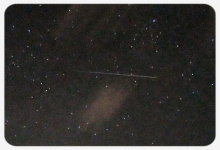 The only time I ever caught a Perseid meteor was in 2008 – I’ve been using that particular photo for all my Perseid posts.